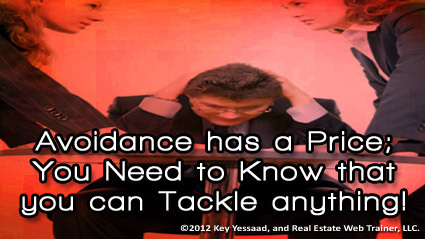 Avoidance and its mounting consequences – Is there a business person or client you are trying to avoid? Have you received a piece of communication you know you must tackle but are trying to ignore? Your natural desire to try to avoid confrontation comes with tremendous consequences; the bad news is that the things and people you avoid do not go away, they linger like a bad rash, but the worse consequence of these avoidances is that they start coloring your current good relationships. The Real Estate Business is a business of people and communication, and you will encounter conflict – how you approach and react to said conflicts will either make or break you. So, what are you currently avoiding? How would you tackle these avoidances? Is there a colleague, mentor, friend who can help you work out these challenges? Is there someone you need seek forgiveness from? Are there promises you failed to keep that you must acknowledge so you can move on? Your humanity matters; re-center yourself and know that you can handle all the business challenges that cross your desk because you are not alone!